Generate a lot of questions beforehand. You do not want to be stuck sitting face-to-face with someone panicking to come up with questions. The more the better. If the interview is running long or you end up not feeling comfortable with one of the questions, you do not have to ask it. It is a lot easier to skip a question than to come up with one on the spot. Having trouble coming up with questions? 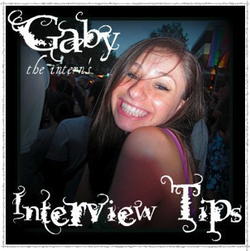 Research the person you are interviewing beforehand. That way, you have some sense of who he is, what he's done, and what you're going to be talking about. It will help you generate more specific questions. Play a game. Come up with a question for every three sentences you read about the person. With these more specific questions, the interviewee will then appreciate the research time you took prior to the interview and may disclose more information in his/her answers. If you are feeling especially nervous for an interview, suggest that you do the interview by email. Though you will not get the pleasure of meeting your interviewee in person, interviewing by email will give you time to generate your questions, as well as time for the interviewee to create the best answers possible. It also saves you the time and effort of typing up all the answers from a sound recorder. You may send just one email out of questions or email back-and-forth a few times if questions arise from previous answers. When interviewing in person, it is virtually impossible to transcribe his answers as he says them. This is why the use of sound recorders is necessary. It also lets you listen and take in his answers, rather than quickly writing down what seem like just words. It makes the interview more of a conversation. With this being said, using a sound recording can prove to be a challenge. If the tape is quiet or scratchy, it can be very frustrating to try to listen very hard to figure out what the interviewee is saying. Placing the sound recorder as close to the interviewee as possible makes a very big difference. Let's just say that it will save a lot of rewinding over and over again. As stated before, interviews are great opportunities, but do not limit it just to yourself. Once you have gathered information, share it with the world. Posting interviews on a blog or publishing them in a newspaper is a great way to continue the experience that you had. The most important thing to remember is that an interview is simply a conversation. You have had plenty of conversations in your lifetime and this is just an additional one. There is no need to freak out. Your interviewee is just as much human as you are. Do not view it as a question-and-answer. Just sit down with the interviewee and discuss. I hope that you take what I learned and use them for your future interviews. Go out there and meet some incredible people, learn about their lives and their professions, and most importantly, share that information with the world.